On the eve of his baby's due date, Michael, a new father to be, gets stranded out of state with his wife in labour back home! In a panic with the birth drawing near, Michael seeks help from an old gas station owner named Bob, a mysterious man with a past who puts Michael's faith to the test in a way he'll never forget. Filled with drama and relatable characters, 'Love Covers All' will challenge and inspire viewers young and old to let go of what's behind and move forward to what's ahead. It's never too late for a fresh start! Features a talented cast including newcomers Jared Young and Jennifer Mercurio, Rhoda Griffis (MOMS' NIGHT OUT, THE BLIND SIDE), Jason Burkey (OCTOBER BABY), Rusty Whitener (LUKEWARM), Rusty Martin Sr. (COURAGEOUS), Shannen Fields (FACING THE GIANTS), Michael Joiner (THE GRACE CARD), and Rusty Martin Jr. (COURAGEOUS). 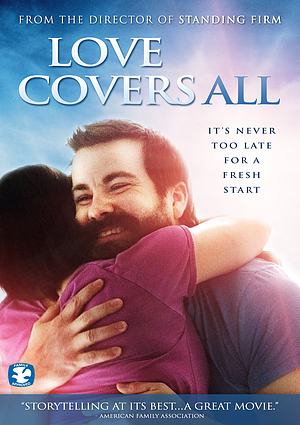 Love Covers All DVD was published by Praise Pictures in November 2014 and is our 14750th best seller. The ISBN for Love Covers All DVD is 798576707460. Be the first to review Love Covers All DVD! Got a question? No problem! Just click here to ask us about Love Covers All DVD.